Another quick and inexpensive DIY gift! I made a few of these for the bridal shower I was in charge of providing gifts or door prizes for the other month. I found these gold bangle bracelets at Heartbreaker 5 for $2! Then I basically used embroidery thread and the only "friendship bracelet" technique I can still remember from 6th grade! You probably know the one I am talking about, the "make a 4 and pull it through"? :) Ha! 1. Cut a loooong piece of thread & tie one end to the bracelet with a knot. 2. Determine how you want to wrap the thread around the bracelet. The video below is the technique I used, (at the beginning of the video). 3. If you want to switch colors, all I did was to tie a knot with color #1, snip the end and then start color #2 making sure to go over the "tail" of color #1 so it gets hidden. 4. When you are finished, tie a knot & you can add a little glue to make sure it is secure! I have been wanting to try these magnets for a while, so when I was asked to make prizes for a shower, it was a perfect excuse to try them out! My dilemma was finding the stones for cheap. Now, when I say cheap, you have to understand my warped idea of what is inexpensive. I finally caved and got 27 stones for $9. This was with free shipping from amazon with our prime account. I also thought the magnets were a little over priced at $1.27 for 10. Am I crazy?! Anywho that turns out to be just under $2.00 for 4 magnets, which isn't that bad I guess. 2. Spread a layer of Mod Podge onto the flat side of the stone. 4. Spread another thin layer over the back of the paper. This seals it, make sure to cover the edges. Let dry. 5. Once it is dry, spread Mod Podge on one side of a magnet and glue it onto the back of the stone! I tried this step with hot glue, but the magnet snapped off pretty easily...Mod Podge actually held the magnet the best. 6. Let it dry again and your done! For example, using a thing sheer chiffon makes for a really pretty, light flower. However, you will need to use more of it to make the flower stand up on its own, or to have any shape. If you are using a "layering-circle" technique you will need a lot of little circles. If you are using a "folded-strip" technique you will need a long strip of fabric. A really stiff fabric, like flannel or a stiff satin, you will need less of it because it will stand up on its own. Fabric Flower Tip #2: Think about fraying. Many fabrics will fray if you don't hem the edges...and I definitely don't recommend spending time hemming for a fabric flower. One wedding dress sash I made I used a fabric that frayed like crazy and when I was done all I could envision was me pulling gray threads off my dress all night!! Ahhhh...nightmare!! So here is my rule of thumb. If it is a fabric that frays a lot then I use my "folded-strip" technique or the "rolly-polly" technique. This way the raw edges get tucked underneath or rolled up and you don't see them. If it is a fabric that doesn't fray very much than you can use most any other technique. 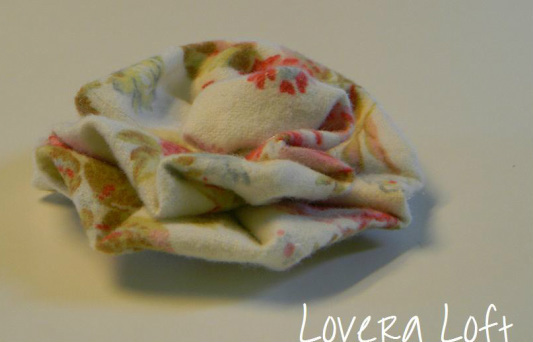 Fabric Flower Tip #3: Use a felt square backing. My first attempts with flowers I tried to make the flower by sewing it "onto itself", which works... but now I use start with a little square of felt and sew the fabric onto the square. This seems to work better, you end up having a large piece to work with at the end to attach your flower to a headband or clip when it's finished. Fabric Flower Tip #4: Make it a clip. This idea occurred to me when I was making my flower girl headbands. I was not sure if the girls would want a hard headband or just a ribbon with an elastic in the back. Which would be more comfortable and which would stay in place? So, I decided to put the flower on a clip and then they could choose which headband to clip it to. 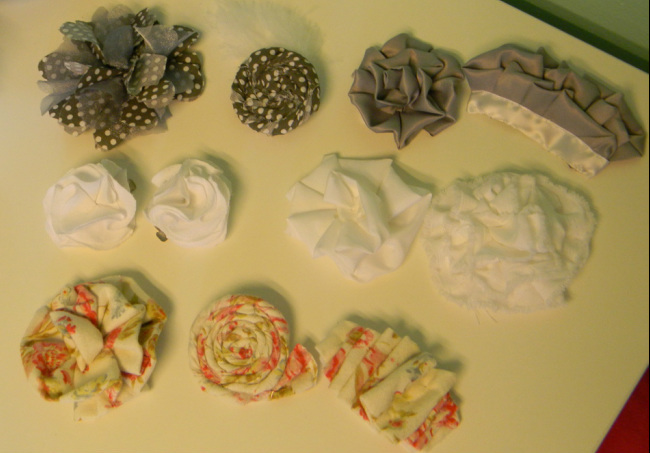 I know not everyone is blessed with thick, course hair like me; which is ideal for headband wearing... ;-) So, now I make all the flowers on clips so that people can either clip it to a little headband or clip it right in their hair! Fabric Flower Tip #5: Be creative & make mistakes!! The blessing with making flowers is that you can just use whatever scraps you have laying around the house, so if it doesn't turn out, no money wasted, no harm done! I cut up T-shirts, use coordinating different scraps from separate projects, whatever! Cut different shapes, fold in different manners, add jewels, buttons, feathers, glue instead of stitch...anything goes! Yay! Does anyone else like to wear headbands? Usually day 3 after not washing my hair is a headband day for me... haha. Now grab some scraps and get creative!!! A Crafter's Contribution-- Shower Prizes! So sorry I haven't posted in like a minute. ("I ain't been to the gym in like a minute!" --if you haven't seen this YouTube video search "Nah Son" its a Dora write-over--hilarious!) I have been happily busy crafting away for a bridal shower/bachelorette party this weekend, and I can't post about any of the crafts given that probably 80% of my readers will be at this shower!! Haha!! However, I did want to write about what I am doing because I think it is a pretty monumental idea for all you crafters out there. Credit is really due to Crafter/Workout Friend Courtney & Dancy Friend Brianna for suggesting that my contribution for the shower should be the prizes! Genious for multiple reasons: (1) I have an excuse to try multiple crafts that have been on my "one-day-to-do-list", (2) If you are like me, you need a deadline to actually finish a project, and a shower has a definitive deadline, (3) I don't have to cook ANYTHING! ;-) If you don't already know this about me, I have been referred to as Martha Steward, but have NEVER been called Betty Crocker. All for now! Check back next week for the full story!! Fabric Flower belt... didn't wear this one, decided on a gray one that I made. 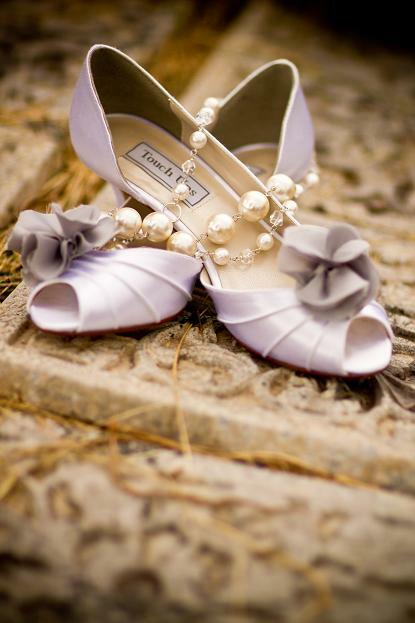 Gray flower shoe clips: made from fabric flowers and clip-on earring backs! Sorry, the picture below is hard to see. It's of my gray flower belt that I made. Below you can see the flower girl headbands & sashes I made for them. Now, for our flowers I can take about 35% of the credit. I had the ideas, found the awesome 80% off flowers at JoAnns, but a family friend that works for Bachmans and helped me put them together. She is a genius, and they turned out amazing!! I have been very excited to make my two ADORABLE nieces cute little headbands to wear as they walk down the isle as our flower girls! Our colors are mostly just gray and white, with a hint of pinks. I bought two pre-made gray hard headbands from Joann Fabrics but also made two headbands out of satin ribbon and elastic. The flowers are on clips so they can be clipped to either headband. I am going to let the girls (or my sisters) choose which is more comfortable and will stay better. 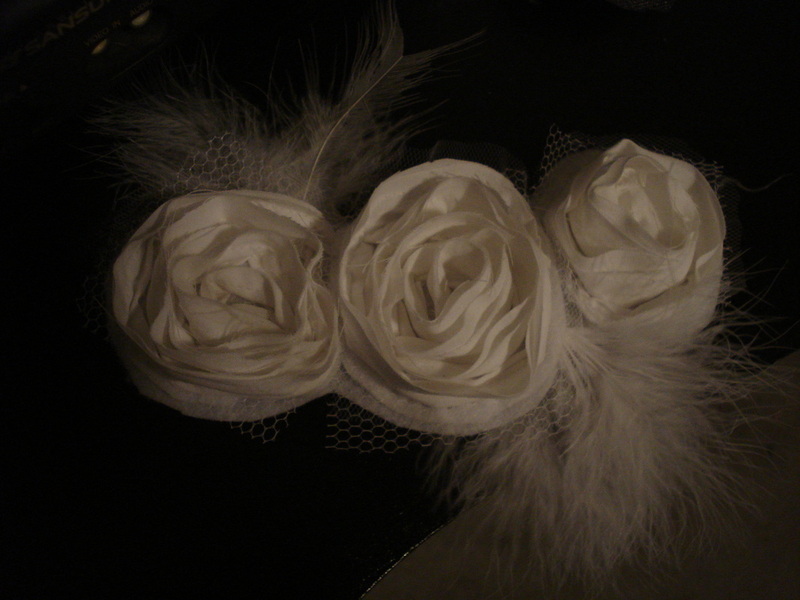 Now, this project is not as creative as making my own flowers from fabric; however I wanted to give this method a try. I do like the results, but the process is not quite as rewarding. 2. Take all plastic parts out, leaving just the pedals. 3. Starting in the back, using a needle and thread, sew the pedals together. 4. If desired, sew pearls/beads/gems into the center of the flower. 5. Cut and glue a small felt circle to the back of the flower. This helps keeps pedals "pushed" forward and gives a place to tack a clip. 6. Sew a clip to the felt on the back of the flower. 1. I took a piece of ribbon long enough to wrap around my waist and tie in a loose bow in back. The ribbon I used was pretty cheap, next time I will buy something with a little bit more weight. 2. For the flowers I cut circles out of organza and a light weight cotton. I started with a large circle and folded it into fourths (ends up like a triangle). I tacked the point of this folded circle with a needle and thread to the ribbon strip where I wanted the flowers. I folded the other circles in the same manner and tacked them on alternating sides of this first "pedal". Each pedal decreases in size starting from the center. By placing these close together they stand up better.